Monday October 22, 2018: Oscar lashes out at his parents, Kristina reaches out to Parker, Carly has a nightmare, and Ryan avoids Laura some more. In the park, Oscar leaves a message with Alexis about taking his case. Joss finds him and wishes him a happy birthday. 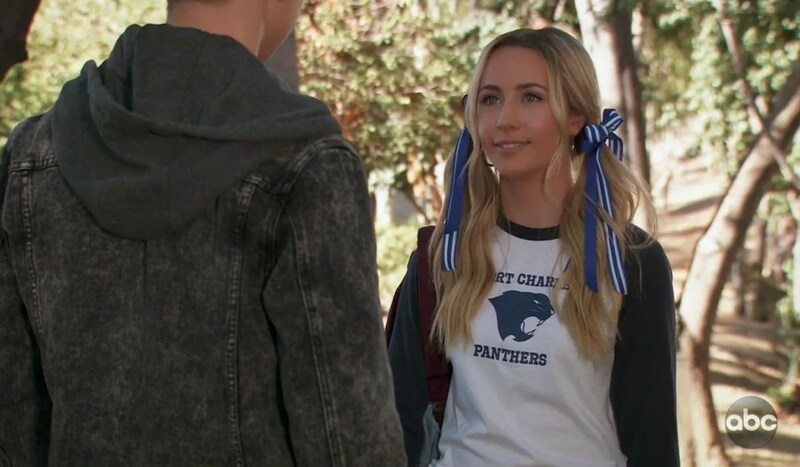 She teases she is going to the pep rally with Cam and invites him out, but he has other plans and leaves. Cam meets Joss later, and she vents that it seems Oscar wants to tell her something but never does. They get ready for the pep rally and Joss makes him take a selfie to post and make Oscar jealous. Drew arrives at Charlie’s and is surprised to find Kim there. She knows he is meeting Oscar for his birthday, which leads Drew to worry their son will feel ambushed by her. Oscar arrives and lashes out at them. He wants nothing from them except to make his own decisions about his health. Kim explains why the drug trial is important, and when Drew backs her up, Oscar calls his father a hypocrite. He chides Drew because he should know how he feels after all those people did things experiments on him without his consent. Drew believes the situations are different, and Kim insists he stay in the trial. Oscar blurts out, “Happy Birthday to me!” and walks out. Meanwhile, Alexis checks on Kristina, and brings up a potential job she heard about in a legal office. Kristina insists she is fine figuring her life out on her own, and Alexis realizes she has put her foot in her mouth again. After Alexis leaves, Kristina steps out to call Parker and see how she’s doing, only to learn Parker is moving on and happy. When Kristina returns to the bar Julian can see she’s upset so gives her the day off. She swipes a bottle of booze and leaves. At GH, Ryan calls Ferncliff and learns the new medication is keeping his brother calm. Laura surprises “Kevin” and asks to grab a drink, but he explains he has a busy schedule and will see her later. Scotty interrupts to welcome Laura back, and let “Kevin” know he was interviewed for a documentary about his brother. “Kevin” can’t imagine why anyone would want to interview him. He storms off, and Laura invites Scott out for a drink. Ryan goes to Kevin’s office and Alexis drops by for a session. She discusses her father issues, her problems with Kristina, and that she’s unsure if she should take on a new client’s case. At home, Carly naps on the couch, but wakes up screaming from a nightmare about the patient in Ferncliff taping SOS on the walls. Sonny checks on her, and she fills him in on the dream, and how she just saw Kevin tapping Morse Code on the table like the patient the other day. Stella arrives with Mike, after his first day at the center, and he is having a confusing day. Carly takes him to the kitchen to help her get some snacks ready for Joss, and Sonny inquires with Stella as to how things went. She gives him a glowing report and assures him that Mike was thriving at the center. Carly and Mike return with snacks, and Carly sees Stella out. Cam and Joss arrive home later and decide to raid the kitchen for junk food. They leave behind Cam’s bike on the patio. Mike and Sonny go out to the patio, and Mike thinks the bike is the one he got Sonny for his birthday as a kid. Sonny reminds his dad he never got him a bike, and Mike recalls he spent the money for the bike on a bet. Sonny advises him to forget it, and Mike notes, “I won’t have a choice soon.” Back inside, Cam and Joss check how many likes their selfie is getting. 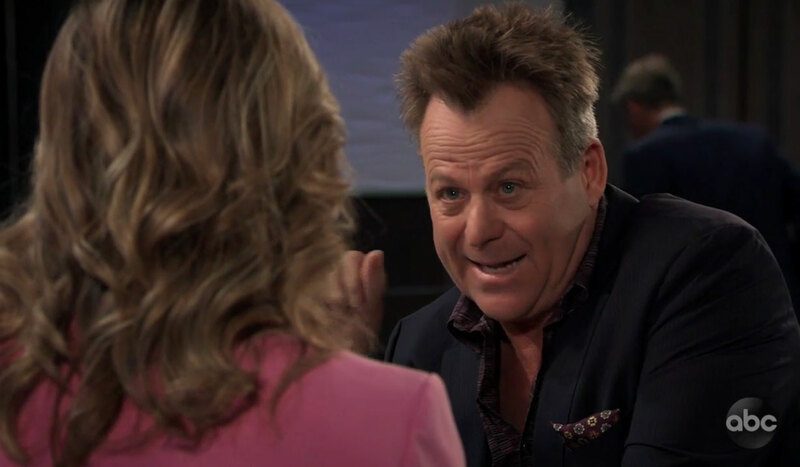 Laura and Scotty grab drinks at the Metro Court, and he admits he sensed tension between her and Kevin at the hospital. She explains he has been avoiding her since she returned. Scott remembers how Kevin’s last marriage went south when he was always off dealing with a patient. Laura never heard about this, so he fills her in on Kevin leaving for weeks at a time to deal with some patient in Seattle which didn’t sit well with Lucy. Laura believes whatever Kevin is dealing with has to do with his brother. Alexis runs into Oscar outside of Charlie’s and says she has been looking for him. She has decided to take his case. In the park, Kristina looks at photos of her and Parker and chugs down booze. Back at GH, Laura stops by Kevin’s office and finds it empty. She decides to leave him a note and is stunned to find a list of women’s names on his notepad. The last name is Felicia’s. Ryan returns and finds her snooping. Nina tells Ava about her daughter. Kiki advises Griffin on how to deal with her mom. Oscar informs his parents that he’s divorcing them. Jason brings a drunk Kristina home to Sam. Ryan insists to Laura that he doesn’t need help. At GH, Liz discovers something and screams for help.